The historic Oaks Park Roller Skating Rink is home to two more teenagers who have competed at the World Skate Artistic Skating World Championships. From October 3-11, Oaks' skaters Annie MacKay and David Hamblin were in Europe competing in the Vendéspace Arena, in Mouilleron-Le-Captif, France. After catching up on their studies, Annie and David spoke with THE BEE about the experience in an interview on the evening of November 5th at the rink. 15-year-old Annie MacKay, a sophomore at Cleveland High School, is the daughter of Oaks Amusement Park's Marketing & Events Director Emily MacKay – herself, a highly-ranked competitive skater. "I got my first pair of roller skates when I was nine months old, starting in a 'Tiny Tots' program; David and I have been skating together since I was very young," Mackay recalled. 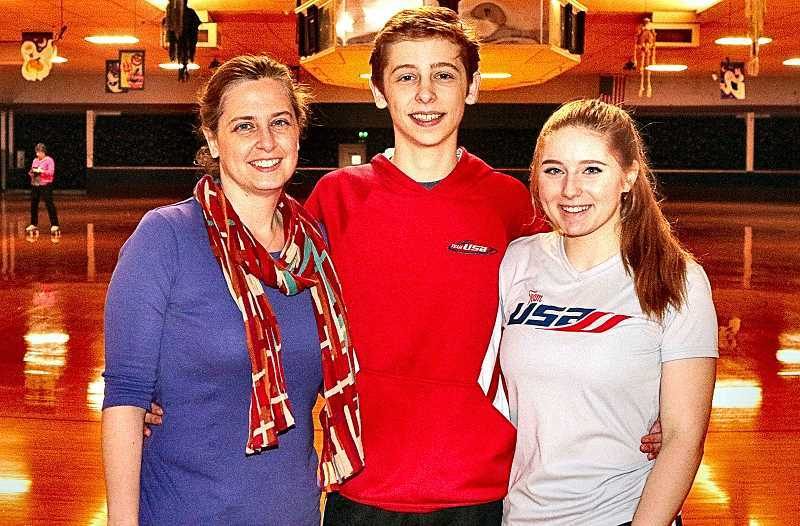 "Yes, I'm younger brother of Charlie Hamblin, who competed internationally, but is now taking time off for college, and is serving a mission for our church right nowe," said 16-year-old David Hamblin, who is currently a student at Roosevelt High School. "Our moms are sisters, we're cousins. I, too, started with 'Tiny Tots', and was in my first competition – at that age, really a showcase – when I was not quite two years old!" Hamblin smiled. At a time when many toddlers still are learning to walk, MacKay and Hamblin began training in couples skating. "Our parents thought this would be a good match, because we've always been best friends – inseparable, in fact – and we both love skating," MacKay remarked. Being cousins who get along better than most siblings, gives them an advantage over other teenagers, they believe – in that romance has nothing to do with their partnership; their focus is on skating. "I have a kind of connection with David that's kind of a 'twin sense'…" MacKay mused. "…like since we were little, we had our own special way of communicating, sometimes without language," Hamblin completed the thought. Only a few competitors make it to the championships held by the World Skate Organization, the international governing body for roller sports. Entrants first must win regional awards, then come out on top at their country's national contest, before being chosen to represent their nation at the World Championship level. "My mom, our coach, has helped us transition into the new system being used by our new governing body; so, not only have we learned to skate the kind of show that takes us to the international level, we're done it while learning an entirely new system of skating," Hamblin explained. The amount of time that his mom, Amy Hamblin, and their other coaches have spent researching and teaching the new skating system, Hamblin estimates to be more than 700 hours. "We've been to the national competitions many times; but going to our first world competition was definitely a highlight for me – so this was super cool," voiced MacKay. "But, the most influential part of the trip was watching the top teams in our event; we learned so much from them, just by being there and being part of that environment." Hamblin pointed out that they'd competed as a team, and he was also a solo contender. "The first major thing for me was meeting people from all over the world, who love the sport is much as I do," Hamblin said. "I can walk up to anybody, and start talking to them, and they're happy to talk to me. "Secondarily, this was the largest crowd before which we've ever performed. I love performing for a crowd, I seem to feed off of their positive energy – and, there was a lot of great energy in this crowd of at least 1,000 people in the stadium." At first, the crowd made her nervous, MacKay admitted, "But, out of the floor, skating with David, I felt this big smile on my face, and then I loosened up and realized there are so many people watching who were there because they love the sport, and they were appreciating my skating – that was an amazing feeling." In couples competition, the team's first performance put them in the 7th spot; after their final show, the judges moved them up to 6th place – 6th among the best roller skaters in the world. "In solo, I'm happy with my performance, and came in 11th; I consider that this was a good foundational year, where I made a good 'first impression'," Hamblin reported. "We don't feel bummed out, even a little bit; for ourselves," MacKay said with a twinkle in her eye. "It wasn't about the placement, it was about the wonder and excitement of being there, with highly-talented people. Although we don't all speak the same language, we all 'speak skating', a universal language!" Just weeks after coming back to Portland, Annie and David were once again gliding around the historic Oaks Park Roller Skating Rink, already hard at work on next season's program.